On February 16th 2014, Aengus played an indoor soccer match that changed his life forever. During the game Aengus slipped, hit his head against a wall and snapped his spinal cord. Aengus is now a quadriplegic, paralysed from the neck down. He has spent the past 4.5 years in the hospital system and now we want to #BringHimHome. 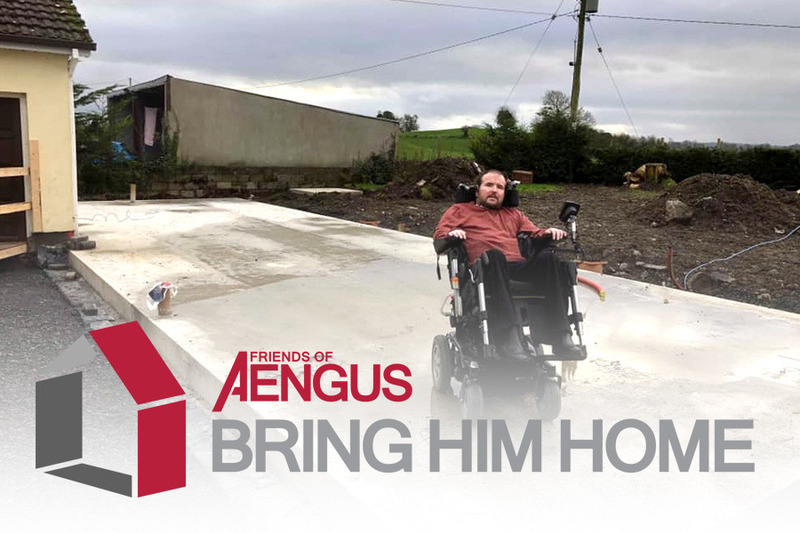 We ask for your support to help bring Aengus home with his purpose built house project. Aengus will need €50,000 to help cover the cost of the build. Each and every donation no matter how big or small will help ‘Bring Him Home’ and is very much appreciated. WOW!!! You have raised €18,675 of our €50,000 goal! Thank you all so much for your continued support. We are well over 1/3 of the way there. Remember, our next BIG event, the 'Knocknarea #BringHimHome Challenge' takes place on Saturday Sept 29th 2018 at none other than Knocknarea. If you would like to join us on the day for a nice inclined walked, we meet in the car park at 11:30AM. Just so it's crystal clear, every single cent raised, minus fees for gofundme, are going directly to Aengus's account to help support his move home. Thanks again to everyone so far who has supported Aengus and to the lads for the amazing effort on the cycle.